Location: North side of Chester Road. Notes: Brownhills station was situated on the 5½-mile Brownhills branch that connected to the Walsall and Castle Bromwich line at Aldridge. The Midland Railway (MR) obtained two Acts to build the line. The first, granted in 1876, authorised a line from Aldridge to Walsall Wood, and the second, granted in 1880, was for an extension from Walsall Wood to Cannock. 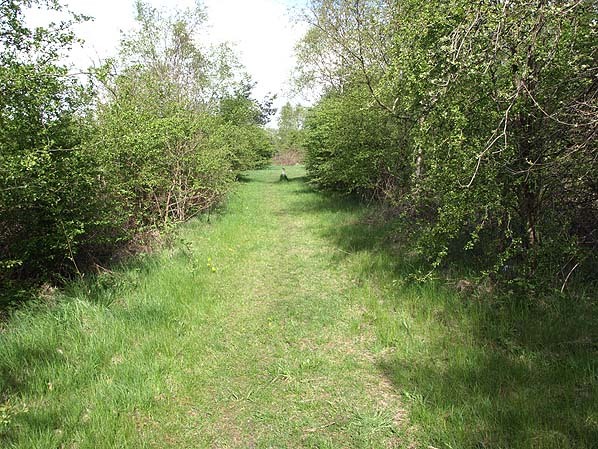 The primary purpose of the line was to give the MR access to the collieries in the Brownhills area, and it opened to goods services in April 1882. A passenger service was introduced to the line on 1 July 1884, and stations were opened at Walsall Wood and at Brownhills. Brownhills was located on the north side of Watling Street in an area of little habitation. Brownhills was half-a-mile to the south-east and was much better served by a station on the London & North Western Railway (LNWR) Walsall and Lichfield line. There were, however, a number of collieries close to Brownhills station, the nearest being called Watling Street. Walsall Wood was quite different. At first there was only one platform which was constructed from stone. Within a few years a second platform, constructed from timber, was provided on the west side of the line. To the north of the Aldridge direction platform there were goods sidings and a loading bay. Although the line continued north from Brownhills, the station was the northern terminus for the passenger service that operated on the branch. The service ran as a shuttle between Aldridge and Brownhills, and by 1895 there were three trains in each direction on Monday-to-Friday, as shown in the table below. On Saturdays there were two extra trains in each direction; no trains ran on Sundays. During the first two decades of the twentieth century the Brownhills branch was extremely busy with goods traffic, the bulk of which was coal. The passenger service had always been secondary, and Brownhills station was not ideally situated to attract passengers. The July 1922 timetable showed the same level of service as 1895. On 1 January 1923 the Brownhills branch became part of the London Midland & Scottish Railway (LMS). On 2 June 1924 they renamed the station Brownhills Watling Street. This was to avoid confusion with the former LNWR Brownhills station which had also become part of the LMS and was given the suffix ‘High Street’. 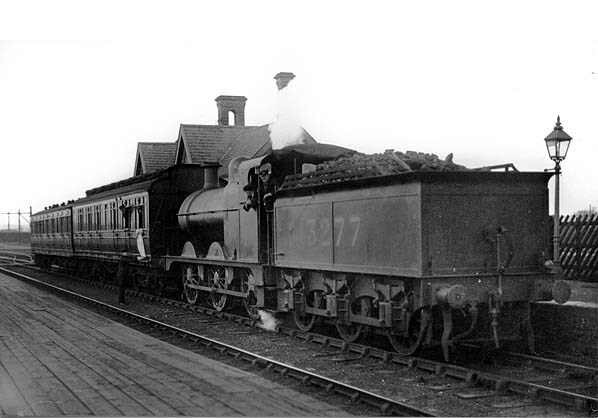 The LMS withdrew the passenger service on 31 March 1930. 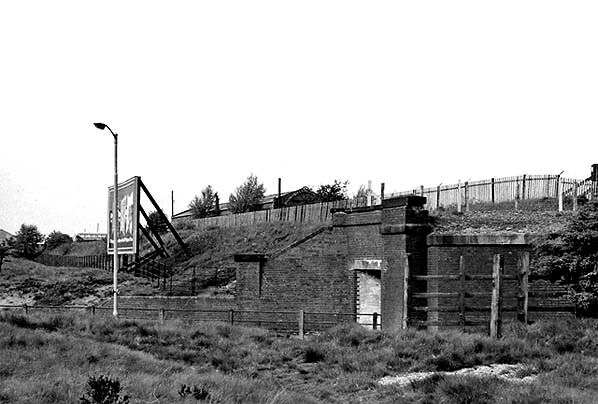 Brownhills Watling Street station closed completely and was demolished, but the line through the station site continued to be used by goods services until the late 1950s, by which time the collieries it served had closed. It was closed north of Walsall Wood and had been lifted by the autumn of 1960. 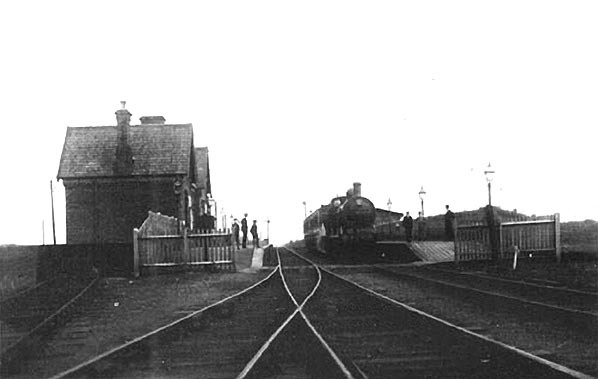 Brownhills station looking south in the early 1900s. The train would have just arrived from Aldridge. Brownhills station shown on a 1902 map. Looking north at Brownhills station on Saturday 29 March 1930. Waiting to depart is the 3.20pm train to Aldridge on the last day of passenger services. A railwayman is seen holding up a closure notice adjacent to the first coach. At the head of the train is Midland Railway Johnson-designed 3F 0-6-0 locomotive number 3277. The engine was built for the Midland Railway in 1891. It passed to the LMS at grouping, then into British Railways ownership in 1948 and received the Midland Region 4 prefix, which it carried until withdrawal from 15C, Leicester (Midland) Shed after well over 70 years service on 15 July 1961.The engine was scrapped during February 1962. A view looking north from the north end of Brownhills station in 1947. The degraded remains of the Aldridge direction platform are seen to the right. 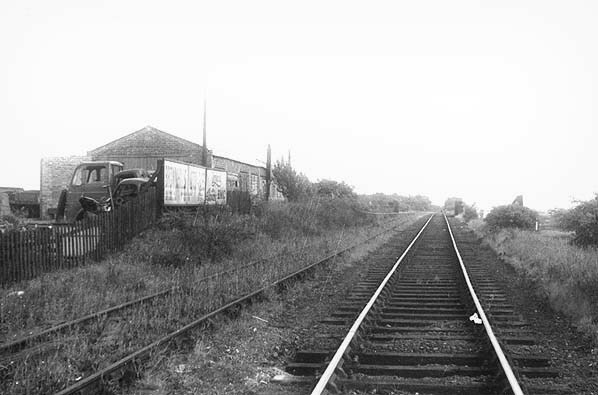 The Brownhills station site looking south in 1951. Looking south towards the site of Brownhills station in 1955. 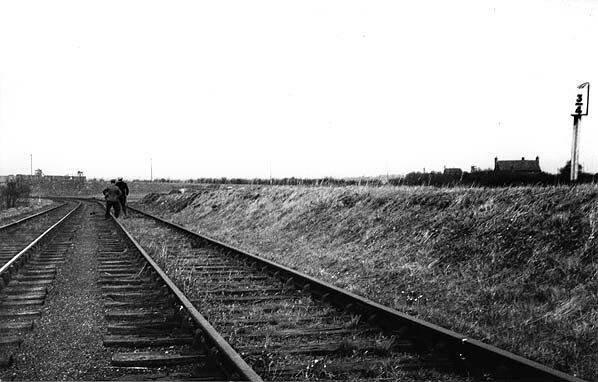 The site of Brownhills station looking south in May 1959. 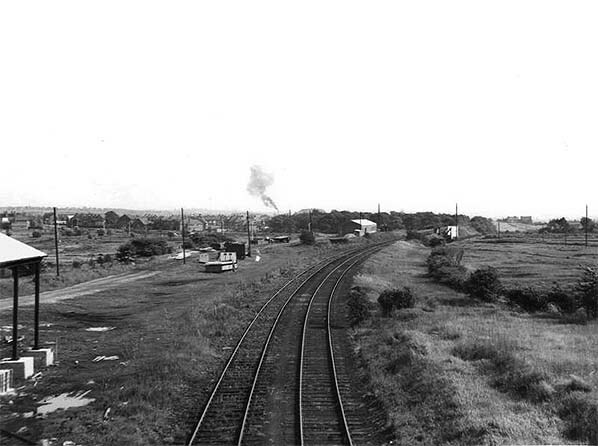 Looking north towards the site of Brownhills station in June 1962. The line had been lifted and the bridge over Chester Road had been removed. Looking north towards Brownhills Watling Street station in May 2013 from a point slightly to the east of the view above. Brownhills Watling Street station site looking south in May 2013. 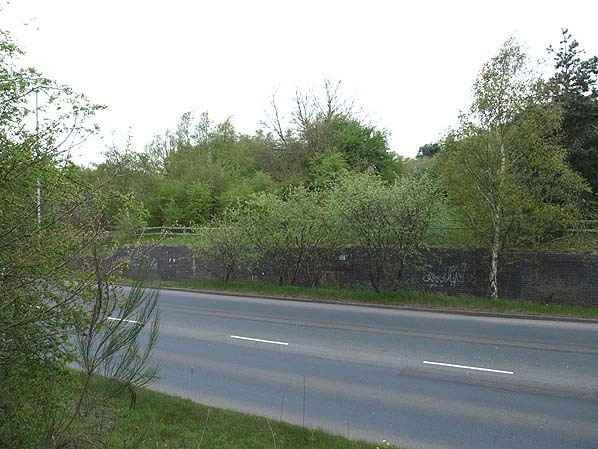 The site of Brownhills Watling Street station in May 2013.